Kickers are grabbing a share of the spotlight in these NFL playoffs—for all the good reasons. 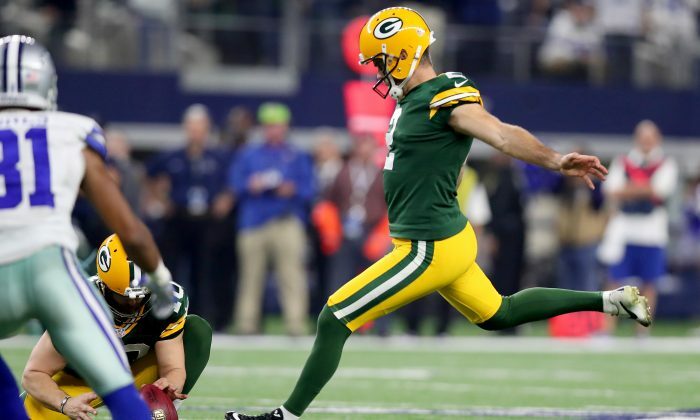 Through eight postseason games, all 30 field goals attempted have been successful and two kickers—Green Bay’s Mason Crosby and Pittsburgh’s Chris Boswell—put up remarkable kicking performances on Sunday. Boswell scored all his team’s points in an 18–16 win in Kansas City. His six field goals set an NFL postseason record. He upped his performance from the regular season—missing 4 of 25 field goals attempted—in a game where his team couldn’t score a touchdown. Arguably more impressive was the kicking display in Arlington, Texas. Crosby kicked a 56-yard field goal to give the Packers a 31–28 lead with 1:33 left. Dan Bailey answered for Dallas with a 52-yard kick 58 seconds later. And then, Crosby kicked two 51-yard field goals—the first one was annulled as Dallas called timeout—to win it for Green Bay. According to Elias Sports Bureau, the Green Bay–Dallas game was the first in history with more than two 50-yard field goals kicked in the fourth quarter—let alone the final two minutes. “It was drifting a little left,” Crosby told NBC after the game. “Obviously, adrenaline, everything going … all that matters is that it went in.” Clutch playoff kicking is not new to Crosby. He went 7-for-7 in the 2014 playoffs. During the regular season, Crosby and Boswell were not even among the top 10 in field goal percentage at 87 and 84 percent respectively. But they’ve both stepped up under the pressure of the playoffs. As for Boswell, currently 7-for-7 in 2016, he can aim for Brandon McManus’ mark–going 10-for-10 as Denver claimed Super Bowl 50. But it will take a minor miracle to catch Adam Vinatieri’s 14 field goals (on 15 attempts) with Indianapolis in 2006. In a season in which kickers came under additional fire for missing extra points, the position may be regaining some respect during these playoffs. The 2015 season experimented with the extra point becoming a 33-yard kick (line of scrimmage being the 15-yard line). The 2016 season made the change permanent. Now what was automatic is far less so. The number of kickers (minimum 10 attempts) with 100 percent efficiency on extra points dropped from 27 in 2013 and 2014 to 6 in 2015 and 5 in 2016. But for all the success on field goals this postseason, somehow extra points remain problematic; a couple of kickers—including Boswell—have missed one. But a clutch kicker is worth his weight in gold. “The greater the parity in NFL games the more kickers play a huge role in the outcome of games,” tweeted CBS analyst and former 14-year NFL kicker Jay Feely. Some kickers have less-than-stellar reputations due to high-profile misses. In last year’s NFC Wild Card game, Minnesota’s Blair Walsh missed a 27-yard kick to win the game in the frigid cold. This year, Walsh went 12-for-16 before being released by the Vikings. His replacement Kai Forbath has gone 15-for-15. And Scott Norwood has not gotten over his missed 47-yard kick 26 years ago that condemned the Buffalo Bills to lose Super Bowl XXV by one point. But the 44-year-old Vinatieri, who many feel is the greatest kicker of all time, truly belongs among the NFL greats. He holds the record with 44 consecutive field goals and has four Super Bowl rings. He’ll always be remembered for his 45-yard kick in blizzard conditions to send the New England–Oakland AFC Championship game (“Tuck Rule” / “Snow Job” game) into overtime during the 2001 season. He then kicked the winning field goal in overtime to send the Patriots to Super Bowl XXXVI, which they won. Kickers don’t have it easy. They’re trying to stay loose on the sidelines for most of the game and then they get called in to make a kick. If it’s a kick they should make, there’s only downside if they miss. But once in a while, the game is on the line and the implications of making or missing the kick couldn’t be more different. For Crosby and Boswell, they live to kick another day.